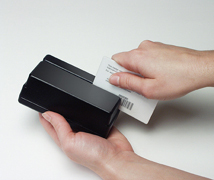 Portable and fixed-mount proximity reader with optional Barcode and Magnetic Stripe. The Smart Prox DC is a proximity data collection reader designed for use in Time & Attendance applications. The reader contains 128K (512K optional) of internal memory which holds a record of each scan with an optional date & time stamp. These readers are perfect for portable data collection such as tracking attendance at training sessions or in classes. The Smart Prox DC is also available as a combination reader with barcode and magnetic stripe reading. The readers are available with RS232, RS422, USB, or TCP/IP interfaces, in both fixed-mount and portable versions.